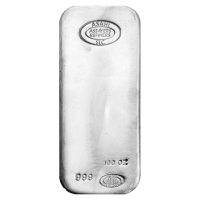 100盎司朝日银条 These silver bullion bars are made by Asahi, who bought the Johnson Matthey refineries in December of 2014. Asahi has now started producing 100 oz bars in these facilities that carry their brand. Asahi are 999 Fine Silver, poured in a loaf shape with lots of character (cooling marks and ripples). These bars are new and direct from the Asahi refineries in Salt Lake City and Brampton, Ontario. If you are looking to buy silver in quantity, this is one of the most economical ways to do so.